Embracing Fluid Typography — Unlike responsive typography, which changes only at set breakpoints, fluid typography resizes smoothly to match any device width. Service Workers and PWAs: It's About Reliable Performance, Not 'Offline' — Service Workers solve a web app reliability problem that AppCache was never designed to solve. How Web Developers Can Adapt to a Mobile App World — Insight into how other web developers and web development companies can adapt to an increasingly mobile world. 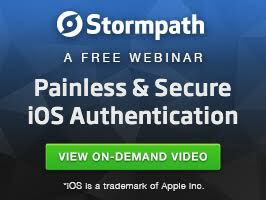 How to Add Secure Authentication to iOS Apps [Video Tutorial] — Join Stormpath iOS Evangelist Edward Jiang for an on-demand authentication tutorial. You'll learn to implement token-based authentication with OAuth2, how to integrate social login using the Stormpath SDK, and find code samples to make it easy. Angular Mobile Toolkit — A tool for automatically creating progressive web apps using plugins for App Shell, Service Worker and Application Manifest. Making Sense of The Mobile Development Ecosystem: Hybrid Apps — Part 2 of my series laying out the mobile development ecosystem covers hybrid apps and hybrid/native apps. What Are The Key Differences Between React Native and NativeScript? — A detailed look at the technical and non-technical differences between these mobile frameworks from the perspective of the PM of NativeScript. EU Welcomes Agreement to Make Public Sector Sites and Apps More Accessible — The first EU-wide rules on making the websites and mobile apps of public sector bodies more accessible. 10 Minutes with Ionic 2: Using the Camera with Ionic Native — Andrew McGivery shows how to use Ionic Native to interface with the Cordova Camera plugin. Convert existing websites to native Android & iOS apps, no changes required — Check our examples, or try it out for free! Uploading Multiple Files At Once with Cordova — How to upload multiple files at once in your hybrid apps using the Cordova FileTransfer plugin. Maintaining Separate Configs for Cordova Dev, Beta and Release Build Targets — Part 4 of a series on devops for Cordova dev’t. Subjects covered are continuous integration, beta testing, over-the-air-updates and maintaining separate configurations for each build target. Building the F8 App with React Native — A series of tutorials designed to introduce React Native, written alongside the building of the F8 2016 app for Android and iOS. Responsive Images with Jekyll — Based on a JekyllConf presentation, shows how to implement responsive images with Jekyll and imgix.